Kathryn Szetela graduated from Bradley University with a Doctorate in Physical Therapy. After graduating, she completed an orthopedic physical therapy residency with the Order of Saint Francis Health Care System in Peoria, IL. 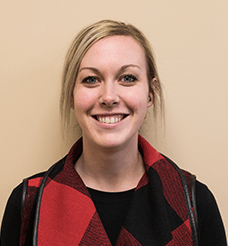 Kathryn has a special interest in working with runners and people working through lower extremity injuries. She treats all orthopedic diagnoses and is comfortable treating vestibular patients and concussions. Kathryn has been practicing as a licensed Physical Therapist for 4 years. Outside of work, she enjoys doing videography and photography, home brewing beer, and cooking.